4 double bedrooms, 4 bathrooms, sleeps 8 maximum. Facing south, with outstanding views over the surrounding countryside, the house and pool stand in 2 acres of terraced grounds, planted with olive and fruit trees. It is extremely quiet and private, whilst being only 10 minutes walk from the village of Sillans-la-Cascade and five minutes drive from Salernes, with its excellent shopping facilities and lively markets. Set back from the busy Cote-d’Azur, amongst hills planted with olive groves and vineyards, the villa "La Mude" is some 15 miles west of Draguignan, the old capital of the Var, and 30 miles Northwest of St Tropez. SILLANS-LA-CASCADE: Dating back to Roman times, the picturesque village of Sillans-la-Cascade seems to have escaped many of the changes wrought on other Provencal villages by tourism. Dominated by its chateau and 11th century ramparts, the sleepy narrow streets and typical mellow stone buildings sit perched above the Bresque River, which flows down to its spectacular waterfall. Nowadays, local people travel from far and wide to feast at the restaurant 'Les Pins', well known for its traditional French cooking and warm hospitality, where one can taste a variety of local specialities throughout the year. SALERNES & NEIGHBOURING VILLAGES: Salernes is a must for anyone interested in pottery and hand-painted tiles and boasts lively markets on Wednesdays and Sundays, together with excellent shopping facilities. Musical concerts in the village square are a regular event on warm summer evenings, and popular with all the locals, who come out after supper to have a nightcap and a quick hop around the square before retiring to bed. Not to be forgotten are the villages of Tourtour, 'the village in the sky', Aups, famous for its truffles, Le Thoronet with its notorious Abbey, Lorgues and Entrecasteaux. LOCAL DISTRACTIONS: These include tennis, only 5 minutes walk from the house, horse-riding in Sillans-la-Cascade and Salernes, and a golf driving range only 10 minutes by car. Golf course 30 minutes away. There is plenty of opportunity for both walking and cycling, with forest and cross-country tracks running directly from the house, with little need to use the roads. Other activities include wine tasting in local vineyards, a visit to the monastery at Le Thoronet, natural caves in Villecroze, the waterfall at Sillans-la-Cascade and numerous picturesque Provencal villages well worth visiting. The Lac St Croix, 30 minutes to the north, offers a peaceful haven to the coast, where one can picnic, swim, windsurf, canoe and sail. The notorious Grand Canyon du Verdon, reputed to be the deepest gorge in Europe, leads into the lake and is well worth a visit for its impressive scenery. There is an excellent choice of local restaurants, a list of which we leave in the villa, together with telephone numbers. Having Holidayed localy for several years, I had the opportunity to buy the land that the house now stands on, it is set away from the main road has fantastic southerly views but is within easy reach to both Sillans la Cascade and Salernes, Sillans la Cascade being a very Old and pretty provencal Village. Walking distance of the well known water fall a must to visit. Having built the house myself with the help of my family in the early 80's it was built too be what I felt was an ideal holiday home. I then went on to plant 80 olive trees which now suplies my family and myself with enough oil to last us the year approx 50 litres. I realy don't think I will ever be able to sell the house it has so many good memories, I am now into the 25th year of renting. And my longest standing rental is a family who are returning next year for the 17th year running. The house has in Total 3 shower rooms and 1 bathroom. Both downstairs bedrooms have ensuit shower rooms. Cloakroom with shower. This covers the Kitchen and Sitting room and benefit the two ground floor bedrooms.The upstaires has a portable unit in the TV room which covers both upstairs bedrooms. Please keep windows shut. Air conditioning unit is reversible so in the winter can give heat to supplement the Wood Burner, Bedrooms heated by electricity. One set of Bed linen is supplied, on request extra linen can be provided but a laundry charge will be made. The washing machine is in the kitchen 3 year old Bosch machine. No Clothes dryer. A Clothes line is to be found just to the right of the house close to the Ping Pong table Badminton court. Normal English toaster. As you would have in your own home. A very comprehensive set of serving dishes with , plates, bowls, side plates, tea cups, coffee cups and Mugs and cutlery for 10, plus wine, Gin and tonic, whiskey Glasses for ten. Satellite TV receiving free TV BBC ITV plus any other free to air programs. We have a Bose speaker to take your Ipod. We have a small selection of Games. A very large Natural and Private Garden the pool is surrounded by lawns watered from a canal running through our grounds, we have below the house 80 olive trees providing my family with Olive oil. Kayaking about 15 minutes away details can be found in the house. Canoes can be hired at the Lac St Coix 30 minutes North of us. The sitting room and kitchen lead out onto a covered Terrace with table for seating 8, there is also a shaded vine covered terrace for 8 - 10 people. We have just discovered a Ski Station 1 1/2 hours away open till Easter snow willing. Courts can be hired close by about 5 minutes by car. We now have a Golf driving Range in Salernes approx. 10 - 15 minutes from the house. 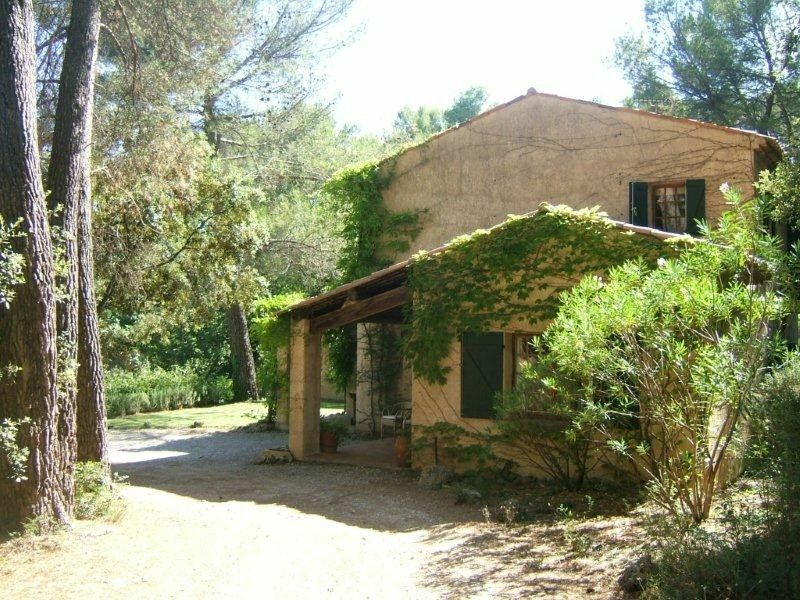 This Provencal Villa is very spacious and comfortably furnished throughout with 4 double bedrooms, 2 on the ground floor, each with their own bathroom, and 2 bedrooms sharing a bathroom upstairs. We now have a second floor TV Room The sitting room and adjoining kitchen are both large and spacious with French windows leading out onto the garden, where there is a shaded arbour with Gas barbeque, table and chairs for eating outside. A cloakroom and a small ironing room adjoins the sitting room, the cloakroom has a shower.. The heated pool is situated a few steps down from the house and lies in full sun, measuring 10m x 5m with a shallow end of 1m. It is cleaned twice a week and the grounds maintained regularly. Garden furniture is provided together with sunbeds for around the pool. Digital satellite, television, I pod Speaker dock and DVD player are available, and there is a telephone in the house accepting all incoming calls and offering a service for local outgoing calls. There were just two of us at La Mude for two weeks in May, so we had a lot of space, and we loved it. The location was perfect for exploring this less-visited (but well worth it) part of Provence. We found the villa spacious, comfortable, and well-appointed, set in beautifully landscaped and well-maintained grounds. The kitchen is roomy and well-equipped (we cook quite a bit). The bed (in the master bedroom, at least) is very comfortable, and the showers are fine. La Mude (both house and setting) is the creation of Edward, the owner and our host, a British gentleman and one of the most interesting and gracious hosts I have encountered in many years of renting vacation accommodations. He is very helpful and engaging if you need something or just want to chat, and he will leave you alone if you don't. His terraced property, with its own brook and fish pond just below the house, is well worth a wander. It is a lovely, isolated place, and the heated pool is the cherry on top. Perfect. Salernes has several supermarkets (overall, Casino is the best). There is a big outdoor market on Sunday morning, and some shops are open while the market is on, but after things close, it is worth noting that there is a small but good shop adjacent to the restaurant in Pontevès that is open in the afternoon, with a good selection of basics, including organic produce and other foods. There are many varied drives and things to see and do in all directions. The Var is much less spoiled by tourism than the neighboring Luberon, although attractive places such as Cotignac and Tourtour have been too commercialized for us. We preferred less pretentious villages such as Ampus, Pontevès, Tavernes (despite the busy road that runs through it), and small Fox-Amphoux, as well as the medieval parts of Aups and Villecroze. The Gorges du Verdon is not far off. If you've visited America's Grand Canyon, lower your expectations a bit, and it is spectacular on its own terms. Enjoy the Var, enjoy La Mude, enjoy Edward. As a package, they will provide a very relaxing, enjoyable holiday. Just returned from a week at La Mude. Lovely clean house and beautifully kept gardens. Pool is gorgeous with great views and is clean and warm. The owner Edward was very kind and helpful. Lots to do in the area. Highly recommend. Just returned from a 2 week stay at the villa. There were 4 adults and 4 kids. Villa is nice and remote and accessible via a bumpy/stony path from the road. Not ideal to drive on but then that's the compromise for the remoteness of our stay. Close to Sillans and Salernes. Salernes has numerous restaurants, a pharmacy and twice weekly market and well worth a visit. The big supermarkets are also that way. Sillans, which is closer, has 3 restaurants, a small child's playing area, pony rides and a waterfall. We also spent two half days at Lac St Croix, which has pedalos, canoes etc and is worth visiting. You should also go to Aups for more restaurants and a walk around. We were a lazy bunch and spent most of our time at the villa. The villa is very authentic and well set out with a good sized kitchen and living area with Sky TV (which helped when we wanted the children out of the sun). The decor is perfectly fine/acceptable (comfortable beds) and has two travel cots and high chairs. Lots of toilets, showers, etc. The steps leading up to the 1st floor are steepish but upstairs also has a seating/TV area. There is no air-con but generally we had no issues and it was in the 90's every day for our stay. Outside the villa has a nice grass patch with shade and a gate which leads down to the pool. So 'up top' is a nice place to eat and let the kids play in front of you. There is also a badminton net and table tennis table (plus bats). Through the gate will lead you onto steep steps down to the swimming pool. The pool is superb and a decent size (10mx5m). It was clean for most of our stay (probably a combination of 8 people + suntan lotion made it cloudy but Edward came and cleaned it and I'm sure would have come more frequently if we had asked). We spent most of our time in the pool. A good sized green area is next to the pool for loungers and has good shade in the afternoon. The only caution I would express if for those with young kids. We had four ranging from ages 2-6 and we had no problems however you will need to keep an eye on them. For example, there are some steep drops/stairs here and there and a (safe) stream next to the pool. However, you should expect this in a villa in rural France and this was part of its charm. We all loved the area and the villa and agreed that we would definitely return (which I guess is the ultimate compliment). We are missing the pool already. I can see why this place is so popular. It was great haveing you too stay just so pleased you enjoyed your selves and I look forward to you returning next year. Salernes and Sillans la Cascade lie in the heart of Provence, 15 miles South of the Lac St Croix,and the impressive Gorge de Verdun. 30 miles inland from the bay of St. Tropez and one hour east of Aix-en-Provence. The nearest large town is Draguignan, 15 miles to the east, but the towns of Cannes, Monaco, Nice and Grasse are all easily accessible. Nice and Marseille airports are both approximately 1.hour15 mins by car. Other Activities: Golf, Golf driving Range, Horse riding, windsurfing, sailing and canoeing Walking, Cross country Biking all within easy reach. We also have a number of very good vineyards all worth a visit. During the heat of the day the caves at Villecroze also well worth a visit.